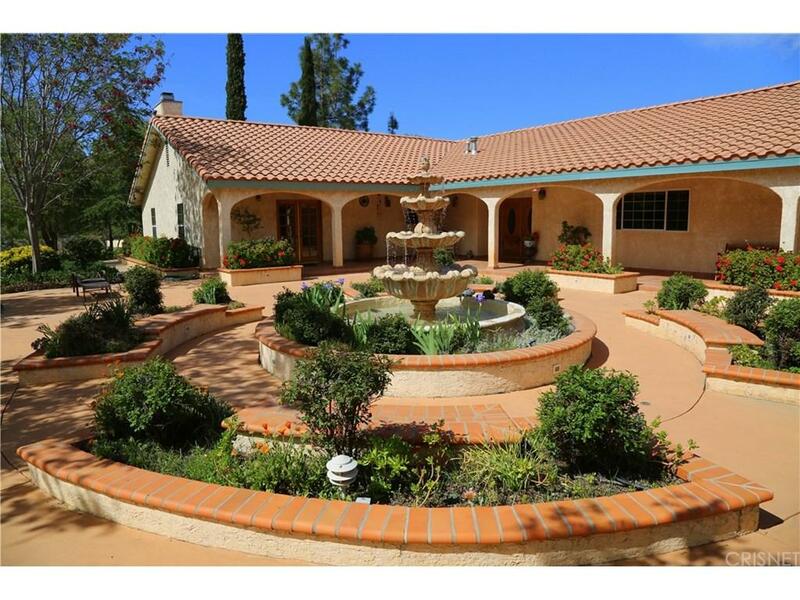 Country Estate on easily one of the most beautiful pieces of property in all of Agua Dulce! Single story, Hacienda style ranch house, 4,080 sf, 5 Bedrooms with 4 bathrooms. Spacious kitchen with Center Island and tons of storage. Formal Dining room, Family-room with raised hearth fireplace and wet bar. The Master suite has a fireplace, refrigerator, sink, separate dressing area, giant walk-in closet and is so large it could be used as a separate apartment. All bedrooms are large. The laundry/utility/mud room is so big it has its own private bathroom. Absolutely stunning park like 7.2 flat and usable acres is completely fenced and private. Mature trees, multiple gardens, patios, walk-ways, built-in BBQ with Granite eating bar and fountains add to the tranquility of the property. 3 car detached garage has large enclosed dog run. 2 Water Storage Tanks. Located off a paved road with electric gated entrance. Plenty of room for Solar, Stables, barns, arenas, tennis courts or miniature golf course. Incredible views from everywhere on the property. This property will not disappoint.